The definition of Information Society Technologies (IST) is now extending to the brain. A Eur10m pan-European research project has created a pioneering 3D brain probing system that may provide new leads for understanding schizophrenia, Alzheimer’s disease and other serious brain conditions. The NEUROPROBES ('Development of multifunctional microprobe arrays for cerebral applications') project is part of the IST theme of the EU's Sixth Framework Programme (FP6) and the probe can sense and activate brain cells both electronically and chemically. "We know quite well what areas of the brain are implicated in this or that activity. We even know what relatively small regions of the brain are involved in learning and cognitive tasks, for example,' said Dr Herc Neves of the Interuniversity MicroElectronics Center in Belgium. 'But the bridge between that regional activity and activity at the cellular level is still incomplete. That's where it is important to have this kind of probing platform." He added that one of the main uses for the system will be to provide precise diagnoses prior to brain surgery, such as in the case of a patient with epilepsy. "You have a patient that is about to be operated on, and you want to remove as little tissue as possible. By pinpointing where the seizure is generated, you remove only that tissue. It means safer, less invasive surgery," he said. Future start-up and spin-off companies are expected to manufacture the probes and keep up with international demand, apparently. 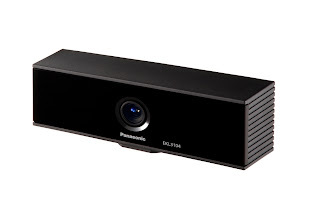 Panasonic (or rather Panasonic Electric Works, the new name for Matsushita) has developed a 3D 'time of flight' motion sensor for outdoor displays and immersive multimedia and points to gesture control of TVs and new types of displays such as an interactive mirror. "We strongly believe that 3D sensing is the key to develop a new way of daily life interaction in the future," says Ken Omori, General Manager at Panasonic Electric Works. "Our technology has the highest performance commercially available for volume production and we are confident in our capacity to help create new gesture controlled systems on a large scale starting now." This video has some key ideas for the future of consumer devices such as an interactive mirror and gesture-controlled TV. The "D-IMager" is aimed at outdoor markets such as out-of-home entertainment, immersive multi-media, interactive digital signage and video arcade games. It also has potential for movement based industrial machines and security markets using shape or anti-tailgating detection. Analysts predict that digital-out-of-home (DOOH) advertising revenues in Western Europe will quadruple from €160 million in 2007 to €626 million by 2012 (source; Screen Digest, Goldmedia; Digital Signage in Europe), driven by the continuous development of technology and innovative ways to reach target audiences. The D-IMager technology enables signs to interact with customers, not only helping advertisers add valuable consumer information for marketing initiatives, increasing transaction sizes and ROI but also helping improve brand recognition in today's highly competitive market, says Panasonic. The D-IMager enables precise motion capture of spatial objects with wide field-of-view within a 9m range by processing high precision (pixel by pixel) data captured by a high resolution infrared sensor. It is designed to blend in with TV displays (indeed the 18Vdc AC adaptor doesn't even come with the unit, making it an integration sell) and is capable of resolving 160x120 pixels (20 or 30 frames per second). It is available with a USB2.0 interface with future models already in development. The TOF technology used in D-IMager can also increase efficiency in industrial processes by helping identify objects and helping robots find items. It can enhance machine vision systems by better imaging, tolerance of lighting variations and less image degradation. Robotics is another promising area for the D-IMager. Today, the use of commercial and industrial robots is spreading rapidly and Panasonic believes the D-IMager helps robots perceive their surroundings in 3D, allowing them to carry out their tasks more precisely and efficiently. Infineon's design centre in Bristol is part of two of the largest R&D projects in Europe for the multicore development for automotive and safety critical systems alongside embedded software house Wittenstein High Integrity Systems (HIS). The involvement in the two multimillion euro ARTEMIS projects is covered in the current issue of SiliconSouthWest. With over 50 silicon designers, Infineon's Bristol centre will be working on new multicore versions of its TriCore microcontroller for a European electric car design based on real time embedded technology and for safety critical systems. For the safety elements, the design of the controller has to be fully documented and verified with new safety critical design techniques developed. The €26m RECOMP project is looking at the isolation of safety-critical parts of systems using multicore technology, allowing software updates without the need for re-certification. There are 41 participants from 8 countries, with Wittenstein HIS in Bristol and the UK arm of Thales alongside Delphi, TUV SUD, EADS and Intel. Infineon is working on a dual core version of its TriCore microcontroller for several of the demonstrators being developed in the three year project. These will cover automotive, aerospace, industrial control systems, lifts and transportation systems. The project aims to provide reference designs and platform architectures, together with the required design methods and tools, for achieving cost-effective certification and re-certification of mixed-criticality, component based, multicore systems for a European standard reference technology. The €36m POLLUX project aims to develop the architecture, component design and prototyping of a electric/hybrid vehicle embedded systems architecture. The project - Process Oriented Electrical Control Units for Electrical Vehicles Developed on a multi-system real-time embedded platform - has 35 participants from 12 countries and is led by Fiat alongside ST Microelectronics, NXP, ON Semi, Continental, PSA Peugeot Citroen and Thales. Other UK organisations involved are QinetiQ and the University of Sheffield. The Bristol Design Centre will be working on the specifications, design and development of another multicore microcontroller architecture, again based on TriCore, producing chips for the subsystems and demonstrators in the next two years. Wi-Fi chip shipments are forecast to surpass 770 million units in 2010, up almost 33% compared to 2009, says a new report from market researchers ABI Research. Shipment of 802.11n ICs will surge ahead of 802.11g and dominate the market this year, accounting for approximately 60% of total Wi-Fi IC shipments. “The 802.11n standard which was ratified last year is a powerful growth engine to drive the Wi-Fi IC market increases,” says ABI Research wireless and semiconductor industry analyst Celia Bo. The cellular handsets segment is seen to be maintaining the highest unit shipment of Wi-Fi-enabled products in next five years, achieving an estimated CAGR of 25% between 2009 and 2015; the penetration rate will reach approximately 40% of total handsets shipped in 2015. Laptops, netbooks, and MIDs are other segments which will see higher shipments across all Wi-Fi-enabled products, and the trend will carry on throughout the following years. “The penetration rate of Wi-Fi ICs in consumer electronic products will continue to grow robustly,” Bo said. “Total shipments of consumer electronic products with Wi-Fi functionality are expected to exceed 530 million in 2015, with a 26% CAGR between 2009 and 2015. Shipments of Wi-Fi-enabled digital still cameras, TVs and DVD players will increase more than tenfold in 2015 as compared to 2009. The demand for Wi-Fi-enabled home entertainment products such as networked game consoles and handheld game consoles is increasing as well: between 2009 and 2015, the CAGR will reach 8% and 6% respectively. Mesh sensor provider Virtual Technology in Israel has teamed up with chip maker Semtech in the US for a two-chip wireless mesh network chipset that brings a new level of performance and signal robustness to smart lighting applications. The chipset pairs Semtech’s SX1211 transceiver for industrial, scientific and medical (ISM) band applications with Virtual Extension’s VE209S wireless mesh controller. Smart lighting designers now have a low-power, high-performance solution for building a wireless sensing network with no single point of failure and very robust signal processing. This low-power chipset is also perfectly adapted to battery-operated applications with a 10-year operating lifetime. The SX1211 is part of Semtech’s platform of ISM-band transceivers and is optimized for asynchronous sensor network designs in unlicensed ISM frequency bands (868-870 MHz and 902-928 MHz). The device features the industry’s lowest receiver current consumption (<3mA) for increased battery life. All of the transceiver’s major RF communication parameters are programmable and can be configured dynamically, with RF output power programmable up to +12.5 dBm. The VE209 family of high-performance mesh controllers serves as the main building blocks of a VEmesh unit, either a gateway or a node. These mesh controllers have the necessary internal elements for performing all the interfaces and network management. VEmesh units provide highly reliable bi-directional communication and best-in-class range and coverage for distributed monitoring and data collection of sensor and metering systems. All VEmesh nodes also act as relays to retransmit data from other units in order to create a modular solution with no practical limitation to the number of nodes or size of coverage area. Availability Evaluation kits (SX1211MESH-868 and SX1211MESH-915) are available immediately from Semtech. 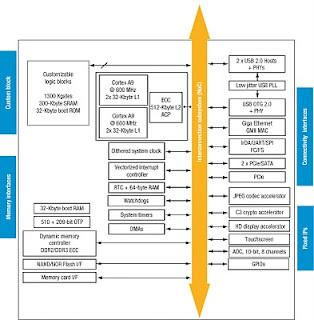 STMicroelectronics has launched a new multicore processor architecture that will be the backbone for the new members of its popular SPEAr (Structured Processor Enhanced Architecture) family of embedded microprocessors, targeting high-performance connectivity and embedded applications. 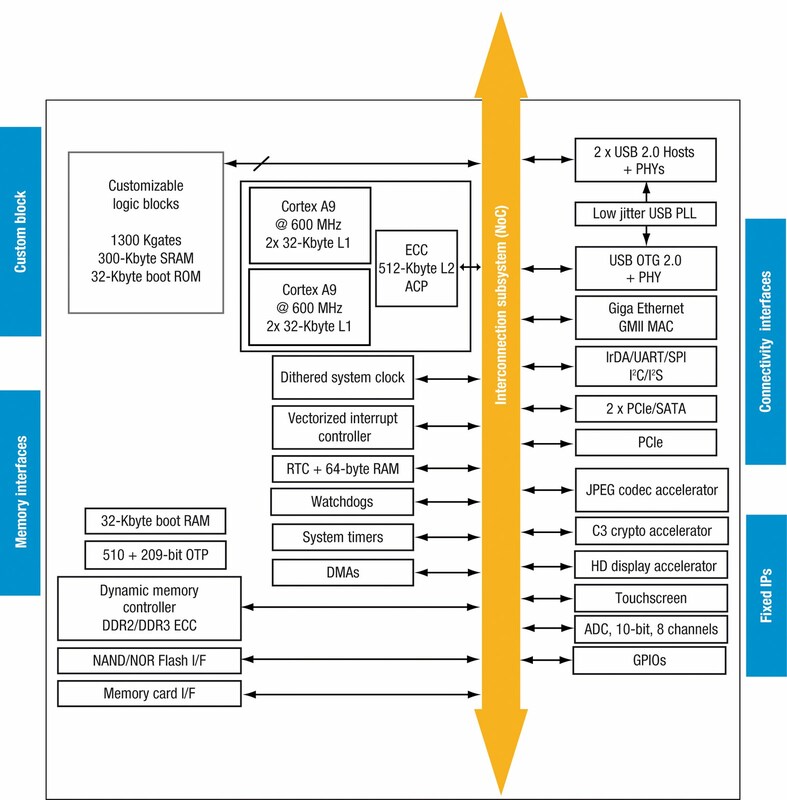 Leveraging its experience of the production-proven SPEAr300 and SPEAr600 lines, the new SPEAr1300 product line couples dual ARM Cortex-A9 processors with a DDR3 memory interface and is manufactured in ST’s low-power 55nm HCMOS (high-speed CMOS) process technology. The dual ARM Cortex-A9 processors support fully symmetrical operation, at speeds up to 600MHz/core for 3000 DMIPS equivalent. The SPEAr1300 makes use of ST’s innovative Network-on-Chip technology for internal peripheral interconnect, assuring support for multiple different traffic profiles, while maximizing data throughput in the most cost-effective and power-efficient way. Initial sampling has already started to early adopters. The new architecture offers industry-leading performance in terms of DMIPS/MHz and power consumption/DMIPS ratios, in addition to cost efficiency and customizability advantages. The availability of integrated DDR3 memory controller and a full set of connectivity peripherals like PCIe, SATA, USB and Ethernet, among other features, make the SPEAr1300 the ideal choice for high-performance applications including networking, thin client, videoconferencing, NAS (Network-Attached Storage), computer peripherals, and factory automation. Embedded microprocessors from the new SPEAr1300 product line will be announced over the next few months, expanding ST’s SPEAr family and providing an extensive choice for leading customers. Wireless sensor maker Dust Networks is expanding the capabilities of its wireless sensor networking (WSN) technology to include location sensing. Dust Networks has combined its work in standards-based time synchronized mesh networking with new time-of-flight ranging capabilities to deliver a new approach to location sensing, Time Synchronized Positioning Time-of-flight (TSPT). Using multi-channel time-of-flight ranging on IEEE 802.15.4 radios, TSPT networks can accurately pinpoint the position of a person or asset to within 1-3 meters indoors or outdoors, even in the harshest RF environments. Conventional real-time-location system (RTLS) technologies typically require a fixed wired infrastructure which can be very expensive to install. TSPT utilizes Dust’s field-proven time synchronized wireless mesh infrastructure which can run for many years on batteries or harvested energy, allowing infrastructure to be easily deployed with no disruption to buildings or their occupants. No wires: every mote can run on batteries or harvested energy. Installations are non-disruptive, and the technology can be readily used indoors and outdoors. No site survey: the self-forming 802.15.4E mesh infrastructure channel hops, and the mesh connectivity automatically adapts as the RF environment changes. No special deployment skills: the network forms automatically, and no field wireless expertise is needed. Location tags, attached to people or assets, also run on low-cost batteries for years. Sensor and control data is readily handled by the tags and network, allowing applications developers to easily combine information about where an object is with information about how the object is. The Dust Networks TSPT products will begin sampling in Q3 2010. STMicroelectronics has launched a 32nm technology platform for the design and development of leading-edge application-specific integrated circuits (ASICs) for networking applications. Central to the new 32nm SoC design platform, which implements ST’s 32LPH (Low-Power High-performance) process technology, is the industry’s first Serializer-Deserializer (SerDes) IP available in 32nm ‘bulk’ silicon. Enabling very large ASIC designs, greater than 200mm2, ST’s new 32nm 32LPH ASIC design platform enables an unprecedented mix of high performance, high complexity, low power consumption and reduced silicon real estate per functional block. The platform is designed to accelerate the development of next-generation networking ASICs used in high-performance applications such as enterprise switches, routers and servers as well as optical cross-connect and wireless infrastructure applications. ST’s SerDes IP, called S12, is a key piece of intellectual property that has already been successfully demonstrated in labs at selected key customers. The S12 IP is vital for the development of ASICs for networking applications and enables chip-to-chip, chip-to-module and backplane communications in networking equipment designs. The first ASIC prototypes implemented in ST’s 32LPH process technology are expected early in 2011 with production ramp-up in the second half of 2011. ST’s 32LPH (Low-Power High-performance) design platform for networking applications supports up to 10 metallization layers to increase routing efficiency. The platform is based on the 32nm High-K Metal Gate process developed within the framework of the ISDA alliance, but also incorporates specific IP and devices from ST, such as embedded DRAM with 10-Mbit per square millimeter density and Ternary Content Address Memory (TCAM). ASICs and the system backplane - the backplane is the internal physical rack inside equipment in which all the system cards are mounted. ST’s S12 IP macro, which is based on ST’s proven SerDes architecture, can be scaled up to eight 12.5-Gbit/s transmit/receive (Tx/Rx) channels per macro. The S12 has been designed with an optimal footprint for flip-chip BGA packages, and will soon be followed by ST’s S14 IP, which can reach up to 14-Gbit/s transmission speed. A senior US offical has admitted the country is losing the cyber war. More than 100 foreign spy agencies were working to gain access to US computer systems, as were criminal organizations, said James Miller, principal deputy under secretary of defense for policy. Hackers have already penetrated the U.S. electrical grid and have stolen intellectual property, corporate secrets and money, according to the FBI's cybercrime unit. In one incident, a bank lost $10 million in cash in a day. "Our systems are probed thousands of times a day and scanned millions of times a day," said Miller at a forum sponsored by Ogilvy Washington, a public relations company and reported by Reuters. The Senate last week confirmed National Security Agency Director Keith Alexander to lead the new U.S. Cyber Command, which will be located at Ft. Meade, Maryland, the NSA's headquarters, and start in October. The move to LED technology will require a redesign of a lighting fixture, says Stephen Page, VP of Engineerig at Cyan Technology in Cambridge. At this redesign stage, for a very small incremental cost it is also possible to add wireless control to a lighting fixture, making home automation much more feaible. Production ready wireless modules, design-in guides, and reference design lighting interface boards make this a straight forward process. Each light will then become a node on an ISM band mesh network. This is used because it is robust (self-healing) and easy to deploy (self-forming). The DSP Group and German chip maker Lantiq have successfully completed interoperability testing based on the latest CAT-iq 2.0 (Cordless Advanced Technology: Internet and Quality) specification. Recently adopted as an industry standard, CAT-iq 2.0 is a key technology to enable advanced communications and infotainment applications driven by IP-based gateways in the digital home. The standard meets the requirement for widespread availability of fully interoperable home gateways, access points and cordless handsets to deliver the best user experience possible. “Industry cooperation is essential for the success of the CAT-iq standard,” said Brian Robertson, President of DSP Group. "We are pleased to collaborate with competing companies to ensure that third-party interoperability is not just a possibility but is actually achieved. The future of converged communications is about giving consumers more choices and flexibility and we are fully committed to continuous innovation to make this vision a reality." The joint testing included interoperability between cordless handsets and residential gateways and demonstrated an excellent user experience of diverse telephony functions including phonebook management, synchronized call lists and multi-line support. DSP Group and Lantiq’s silicon and software solutions are deployed in many IP telephony and gateway products, including xDSL, cable, xPON and office PBX, providing multi-line and multi-handset control, natural wideband voice and advanced data services. “Interoperability is a significant milestone in bringing the CAT-iq 2.0 specification to market and is the key to the standard’s success,” said Ulrich Huewels, SVP and GM of Business Unit CPE of Lantiq. “Lantiq has an extensive background in interop testing with competitors through its carrier engagements in voice and DSL, and with CAT-iq, we continue to pursue this path to ensure the future success of industry’s new standard. Lantiq reinforces its commitment through its investment in the technology by embedding CAT-iq in all of its residential xDSL and Ethernet-based gateway devices. 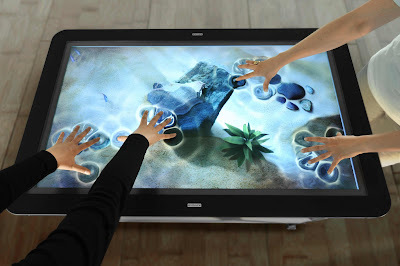 Evoluce in Germany has launched its first gesture computing enhancement to its ITSO (Integrated Through Screen Optics) Sensing Technology, offering true multi-touch, multi-pen functionality for large flat screen LCDsfor a fraction of the price of Microsoft's Surface technology. For the first time, multi-touch-enabled applications can also see and respond to in-the-air gestures up to 1 m from the screen for more intuitive and direct user interaction. The combination of gesture with multi-touch input unleashes exciting possibilities for a multitude of collaborative, design, and information visualization environments. This provides true multi-modal computing. Evoluce’s ITSO Sensing Technology supports an unlimited number of simultaneous screen inputs from touches, pen and stylus inputs, objects, and tags. Now users can also directly manipulate objects on the screen through making scrolling, rotating, stretching, shrinking, or pivoting motions close to the screen without touching it. The innovative ITSO Sensing Technology software solution is built into the Evoluce ONE, a 47-inch large-format interactive full HD LCD screen with true multi-touch and multi-pen functionality. The Evoluce ONE delivers sharp, bright images for rich multimedia applications ranging from educational teaching and learning environments to medical imagining and interactive gaming. Its smooth, scratch-resistant screen delivers the durability necessary for point-of-sale (POS) public product presentations and interactive exhibits at events, VIP lounges, art galleries, and museums. Because of its flat edges, Evoluce ONE is easily integrated into either horizontal or vertical spaces, or may be used as a stand-alone surface. ITSO Sensing Technology supports multi-touch operation of Microsoft Windows 7 desktop and applications, providing the familiar Windows interface to users. Evoluce supports all standard interfaces for multi-touch application software development, including Java, XML, and TUIO. Just look at the size of this! 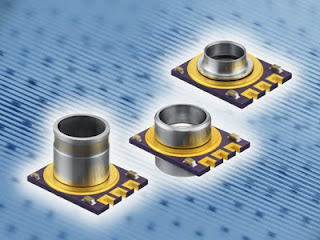 Atmel has launched the world's smallest flash AVR microcontroller package, putting 12MIPS of processing for 50c in a mere 4 square millimetres, driving the trend to 'silicon dust' - processors so small they start to sit almost anywhere from connectors to leads to clothing. The Atmel ATtiny4, ATtiny5, ATtiny9 and ATtiny10 AVR microcontroller (MCU) come in an ultra-small 8-pad UDFN package, with a dimension of only 2mm x 2mm x 0.6mm, and weighing less than 8 mg to reduce the package size as much as 55 percent compared to the market's smallest package offering available today. These products target applications in the consumer electronics, lighting, and industrial control markets. The new devices are well suited for lightweight and small form factor consumer applications, such as cell phones, toys, tooth brushes and other personal care and portable electronic products. The smaller, lighter, faster and low-power microcontrollers from the Atmel ATtiny4/5/9/10 family also make it possible to integrate a powerful AVR MCU in some of the smallest designs. These designs may include the inside of electrical leads and miniature connectors, printer heads, and other applications such as inside clothing fabrics, plastic cover sheets or shells. "This new package offering will strengthen Atmel's leadership in the microcontroller market," said Ingar Fredriksen, AVR Product Marketing Director. "In addition to being 55 percent smaller than any other 6-/8-pin Flash microcontroller in the market, the ATtiny4, ATtiny5, ATtiny9 and ATtiny10 devices deliver six times higher processing speed than the closest competitor." This family is based on Atmel's patented low-power picoPower technology which enables any AVR microcontroller to operate at the industry's lowest power consumption at 650 nA, with a RTC running, and less than 100 nA in power down. These products also contain a rich feature set to execute code up to 12 MIPS at 12 MHz. The Atmel ATtiny4, ATtiny5, ATtiny9 and ATtiny10 are available now. Volume pricing start at $0.52 USD for 10k quantities. Module provides medical and industrial users with access to wireless sensor data. Enables the deployment of hybrid sensor networks that use both ZigBee and Bluetooth protocols. Libelium in Spain has developed a new Bluetooth module for its Waspmote wireless sensor network (WSN) platform that enables wireless sensor networks to be directly linked to portable devices such as smart phones, PDAs and laptop computers. This is particularly useful for medical applications and for industrial diagnostics and when combined with the Meshlium multi-protocol router, it supports the deployment of hybrid ZigBee- and Bluetooth-based wireless sensor networks. The new Bluetooth module extends the Waspmote platform by offering a new choice for radio communication. The platform is extremely modular allowing the use of a wide range of modules for both wireless communication and sensors. Now WSN users can choose between a Bluetooth module and a range of ZigBee modules covering the main frequency bands (2.4GHz, 868MHz, 900MHz). Libelium CTO David Gascón says, “This module will be particularly useful for medical applications requiring the integration of biometric sensors and for sending sensor information to Bluetooth-equipped industrial systems”. He adds, “Users with existing Bluetooth-based infrastructure will be able to extend it to include Waspmote and its range of sensors”. The new module exploits key features of the platform such as power management. The Waspmote internal microprocessor minimises energy consumption by switching the radio module on and off at the necessary intervals. The new module is able to send sensor data frames to smart phones that support Serial Port Profile. Security mode is implemented with PIN validation which can be preconfigured such as a “Network Key” and it allows the management of a Trusted Nodes list in order to create secured networks. Waspmote users are also now able to build hybrid networks with both Bluetooth and ZigBee sub-networks if they use the Libelium Meshlium multi-protocol router to bridge between the sub-networks. With both Bluetooth and ZigBee using the 2.4GHz industrial, scientific and medical (ISM) radio band there is the possibility of interference. For this reason Waspmote enables Bluetooth and ZigBee communication to work in the same environment by using Adaptive Frequency Hopping (AFH) which enables the Bluetooth radio to dynamically identify channels already in use and to avoid them. Users are able to flexibly change a device between ZigBee and Bluetooth as all the modules use the same kind of socket on the Waspmote board. The platform has an open source API and programming environment; new libraries are available to support the Bluetooth module. David Gascón says “Waspmote’s architecture means that each additional module adds value to the platform”. Complete documentation and code examples can be found at http://www.libelium.com/waspmote. NXP Semiconductors in 2009 took the top position in the global automotive infotainment semiconductor market according to market researchers iSuppli, the first time the company has held the top spot since the company began tracking the area in 2005. NXP in 2009 posted automotive infotainment semiconductor revenue of $291 million. While this total was down 24.8 percent from $387 million in 2008, No. 2 STMicroelectronics also saw a significant fall in its revenue, declining by 37.4 percent if compared to 2008. As a result, NXP was able to displace STMicroelectronics as the world’s leading infotainment chip supplier. NXP’s share of the global market for infotainment semis amounted to 11.5 percent in 2009, while STMicroelectronics accounted for 10.9 percent. Maintaining its No. 3 position was Panasonic with revenue of $193 million, down 36.3 percent year-on-year, while Renesas Technology stayed in the No. 4 slot with revenue of $191 million. The only market share gainer for the year was UK-based Cambridge Silicon Radio (CSR), which in 2009 merged with U.S. GPS and multimedia baseband provider SiRF. The combined operation pushed CSR into the No. 5 slot in 2009 with revenue of $167 million, up from 15th place in 2008. Outside the top five, Japanese audio and FM tuner supplier ROHM stood at No.6 with annual revenue declining by less than most of its competitors to $140 million in 2009, down 9.7 percent from 2008. Positions six through 10 were dominated by Japanese semiconductor manufacturers, with the exception of Texas Instruments (TI). TI moved up one position from ninth to eighth with revenue of $80 million in 2009. Japanese manufacturers accounted for 34 percent of global infotainment semiconductor revenue in 2009, while European-based manufacturers accounted for 32 percent. In contrast, American-based manufacturers accounted for just 11 percent of the global total in 2009. In spite of these tough numbers, companies that had good exposure to the Chinese vehicle production bonanza of 2009 were able to keep pushing against a strong headwind in the overall market. TDK-EPC has extened the range of its EPCOS MiniCell series of pressure sensor transmitters to unsymmetrical measurement ranges from 0 to 500 hPa and 0 to 2500 hPa. In addition, variants are offered for symmetrical measurements from -500 to +500 hPa and -2500 to +2500 hPa. With dimensions of only 19.6 x 16.2 x 11 mm³ the differential pressure sensors feature a compact design. Two stainless-steel membranes are incorporated to separate the media. All MiniCell variants have a small oil volume and use a single chip approach for genuine differential pressure measurement. This enables showed high accuracy and reproducibility of the measurements. The stainless steel membranes and supports also make them suited for use in aggressive media. The electronics of the MiniCell transmitter are hermetically sealed in inert oil inside the ceramic package. The transmitters are designed for a broad temperature range from -40 to +140 °C. At a supply voltage of 5 V, the transmitters supply an analogue output voltage of between 0.5 and 4.5 V. The maximum measurement error is only 1.5 % FS (full scale) over the entire temperature range. Applications of the MiniCell transmitter include process engineering, the chemical, food and water industries as well as aviation measurement systems. In addition to standard versions, customer-specific housings are also available for standalone applications. ACAL Technology is sampling the latest generation of 2.5 inch SATA Solid State Drives (SSD) from Western Digital which more than doubles the read/write transfer rates of the previous generation combined with drive endurance and consistently high sequential write speeds. The N1x series of SSDs is based on Single-Level Cell (SLC) media for write-intensive, embedded OEM applications with up to 24/7 operation. It features a native SATA 3.0 Gigabit per second (Gb/s) interface which delivers target read speeds of up to 240 megabytes per second (Mb/s) and write transfer rates of up to 140Mb/s. The drives are available with capacities of 32, 64 and 128GB. 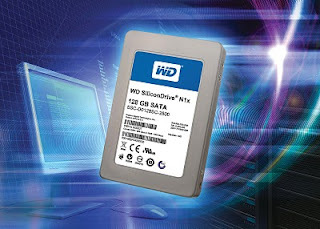 In addition to patented and patent-pending Western Digital technologies, the drives support Native Command Queueing (NCQ), SMART and Windows 7 TRIM commands. Based on proven Western Digital technology, the SSDs have a high tolerance to shock or vibration and can operate across a temperature range of 0 to 70 degrees Centigrade. The applications which would benefit most from the N1xx’s speed and longevity include database or multimedia servers, digital graphics rendering, NAS server and storage arrays, storage appliances and video on demand as well as telecom and wireless networking infrastructure. DNA as the future of silicon chips?